Designed to minimize space requirements, the SSS-Q series 4-channel solid state switches replace 4 individual SSS modules. Providing a connection between data acquisition systems and the real world, these modules can sense or control ac/dc power lines. Input modules sense the presence of an ac/dc voltage, and send an input signal to the acquisition system. Output modules accept an output signal from the system, and will switch ac/dc power lines on or off. 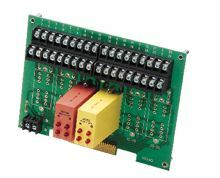 Each module contains four channels of input or outputs. Up to 6 modules may be mounted on a 6000-DEXB-C backplane for a twenty-four channel system. 참고: Backplane requires 5Vdc power.